Foshan of Guangdong province, China, is famous for its martial arts, thanks in part to martial artist, Wong Fei Hung (1847-1924). There are many movies made in the name of Wong Fei Hung, but on the mention of Ip Man (pronounced Eep Mun), our mind would no doubt draw a blank. 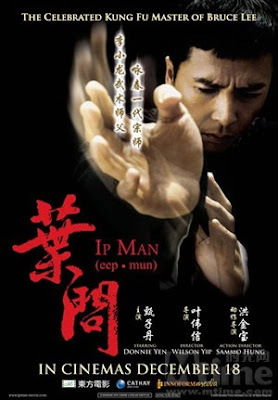 Who then is Ip Man and why would it be of interest for a movie to be made in his name then? For a start, Ip Man (1893-1972) is the expert in the Wushu fighting style of Wing Chun, and is the master of the famous Bruce Lee. As there has never been any previous film record of Ip Man, this film produced by Raymond Wong and directed by Wilson Yip will be the very first. The movie opens and dates back to 1935 Foshan, with the city bustling with activities and various schools of martial arts are seen busy with the practice of their craft. In the people’s mind however there would be only one martial artist who is the best. He however would have no interest in opening a school to teach his art. He is Ip Man, played by Hong Kong action star Donnie Yen. Our introduction to Ip Man began on the day when Master Liu (Chen Zhi-Hui) visits Ip Man at his residence when the latter is having dinner with his wife and son. Being the typical martial arts enthusiast that Master Liu is, he declined to leave when advised by Ip Man to come back at another time, choosing instead to stay and wait until Ip Man have finished his dinner. He is eager to test his skills against Master Ip Man. The mood here is not of hostility but of a light hearted and humorous fashion. Ip Man even invited Master Liu to sit and have dinner with his family when he spots him restlessly waiting by the living room. We see here the humble and modest character of the protagonist. When the sparring finally got underway, it ended as swiftly as Ip Man’s strokes suggest. Because in three strokes and a set of quick fists, he had Master Liu at his peril, well defeated yet without injury, as this was all but a friendly exchange in the spirit of martial arts. The essence of Ip Man’s fighting style, Wing Chun, is characterized by its tall narrow stance with effectiveness demonstrated through speed and power. It reminds of the time when Bruce Lee had to slow his punches down during filming, as they were just too fast for the cameras back then to capture. In the world of martial arts, with all its attractiveness, it also brings with it the competitive nature of those who practice them. With competitiveness taken the wrong way, things can go awfully wrong when all one wants to achieve is to have the other beaten so as to prove who the superior fighter is. 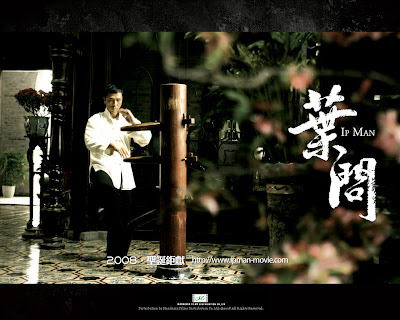 A thug in Kam Shan-chau (Fan Sui-Wong) later arrives and challenges the various schools, defeating their masters ruthlessly, until he came face to face with Ip Man. Kam lost to Ip Man with a lesson he ought to have learn, only that he did not and left Foshan with only disgrace in his mind. The people celebrate as they hail Ip Man the savior who brought glory to Foshan by sending the thug away. The fight ends but the story have only just began, and with it a change of mood from lightness to heavy because war has broken. The Japanese have seized Foshan. What follows will be Ip Man’s struggles and challenges as he has to make ends meet for his family in the dreadful time of adversity. It is here we see the true character of Ip Man, who has captured the hearts of the people of Foshan and their respect. This is most notable among his friends in Chow Ching-chuen (Simon Yam), his son Chow Kong-yiu (Calvin Cheng), and Crazy Lam (Xing Yu). To mistake this film, as one of just good versus evil is easy because in a movie that has a hero, there must be a villain. There are a few characters here befitting of the role. We have the Japanese general, Miura (Hiroyuki Ikeuchi). We have the aforementioned thug, Kam Shan-chau. We also have police officer turned interpreter, Li Chiu (Lam Ka-tung) who appears to be a traitor. The film here however should not to be seen as a fight against evil but rather of the depiction of humanistic values that Ip Man himself would possess. There are many meaningful messages encrypted in the various plots and subplots in this wonderful film that really is about virtues more than anything else. As producer Raymond Wong would suggest on why the production team had chosen to make this film, it is that of really making a kung fu movie that is authentic and real, moving away from past attempts at glorifying and stylizing violence on screen. The intention is to make a film that would reflect the spirit of Chinese kung fu, and what better than to portray it through the virtuous character of Master Ip Man. I would have like to compare this film to Fearless aka Huo Yuan Jia (2006), starring Jet Li, which strings from a similar root, but at the very core, the approach is different. While Fearless is written in a more dramatic nature, with a more compelling story and edited with a creative dimension, Ip Man is honest and direct because that is who our protagonist is. What stood out for me in Ip Man is when he ponders in introspection about what use his training and expertise in Wing Chun all his years would come to. It would appear that there is destiny waiting to be fulfilled. And he would also influence those around him with what he has and even lead those who have been wrong to do right despite the pressure of circumstances, because to the very basis, it is the right thing to do in humanity. History means nothing if its lessons are not learned. The film also stars the stunning Xiong Dai Lin as Cheung Wing-sing, Ip Man’s wife, and I must also not forget to mention that the acclaimed Sammo Hung directs the action. The date of this review is stated as 2 Jan 2009, but it did not take till 12 Jan 2009 to get it published. I had started writing this review on 2 Jan but had found the draft too technical in style. I could not put what I really had in mind into words as it just wouldn't flow. My suspicion is with the fact that I had researched and done two technical papers before deciding on writing this review. The dry and informative style stuck with me for awhile before I finally shook them off a few days back through reading lots of different articles and books to stimulate the mind. I'm glad to finally set things right again. LOLz. On a side note, this is also the first review I've done on a Chinese Hong Kong film and it proved to be quite a challenge because it is in ways different from that of English Hollywood productions. I will attempt Red Cliff II next (another Chinese film).